So you’re tired of heading to the coffee shop every morning, but you need your espresso intake. Ever since the invention of the Keurig, everyone is familiar with the concept of pod-based coffee machines. However, you might not be as familiar with pod-based espresso machines. You get the complex taste of a freshly brewed espresso and the convenience of a one-button coffee machine. What exactly is an espresso machine with pods? Is it even possible to make a good cup of espresso using a pod-based machine? In this day and age, the answer is yes. While traditional espresso machines create espresso by pushing water through finely ground coffee using a large amount of pressure, these pod-based machines mimic the taste of espresso using traditional coffee brewing methods. For people who are caught up in the semantics, it may not be a “true” espresso. However, the taste is almost identical, and the convenience factor is a huge selling point. These machines are redefining the what espresso is by proving that you don’t need a complex or expensive machine to make a great tasting espresso. By opting for a pod-based espresso machine, you reduce the prep and cleanup involved in making espresso. All it takes is loading the pod, selecting your drink of choice, and hitting the dispense button. Some machines come with additional features, such as a milk frother or different temperature settings, but at the very minimum, an espresso machine with pods dispenses extra strong shots of coffee to satisfy your espresso cravings. If your mornings are spent rushing around the kitchen, frantically trying to gather all of your things before sprinting off to work, you probably don’t have time to mess around with a complicated espresso machine. And rather than wasting time standing in line at a coffee shop and spending hundreds of dollars a month on overpriced coffee, you can brew yourself a barista quality espresso at home. Espresso machines with pods appeal to on-the-go, cost-conscious people who don’t want to give up the favorite part of their morning. Convenient: It has never been easier to make a high-quality cup of espresso at home. Now that espresso machines with pods are widely available, you don’t rely on a barista to make you a drink or purchase a clunky machine. Most people don’t own espresso machines because they know they won’t go through the trouble of actually using it. Instead, why don’t you buy a machine that everyone can use? Cost-saving: When you start doing the math on how much your espresso habit adds up to be annually, it’s probably enough for you to rethink your choices and consider drinking tea instead. Rather than cutting espresso completely out of your life, you can now have an espresso at a fraction of the cost, making your habit completely guilt-free. Traditional, top-of-the-line espresso machines can run you up to $10,000 dollars. Thankfully, the average price of pod-espresso makers is around $200. Easy Clean-up: The process of making espresso has never been easier, so it only makes sense that the cleanup process is a breeze as well. These machines are low-maintenance and perfect for those lazy mornings you don’t feel like don’t any dishes (which usually ends up being every morning if we ’re being honest!). Less Bulky: If you’ve ever seen a proper espresso machine, you understand why those machines are not a staple in everyone’s household. Espresso machines are bulky, heavy, and hard to maneuver. Even espresso fanatics may not have enough room for a real espresso machine. Simplify your life with a space-saving pod-based espresso machine. Not “True” Espresso: For espresso snobs, this might be the deal breaker. The definition of espresso is coffee that is creating by forcing steam through coffee beans. Since the espresso or coffee shots are not created in this method, some people may label it as strong coffee. For most people, it’s a small price to pay for the convenience, but die-hard espresso lovers may turn their nose at strong coffee that is masquerading as espresso. Not All Machines Include Milk Frother: If you’re looking to kick your coffee shot habit, you may be disappointed that an espresso machine with pods doesn’t come with a milk frother. This may be a crucial part of your coffee shop experience, so you can either spring for an expensive method with a milk frother or buy a separate milk frother. Wide Variety of Cup Sizes: You may not want a strong shot of espresso every day, so make sure to get a machine that has a variety of cup sizes to choose from. Sometimes you may want to mix up your routine with a traditional cup of coffee. Compatible with refillable pods: Many people are hesitant to invest in a pod-based machine in fear their favorite coffee grounds will go to waste. Make sure to pick a machine that works with refillable pods. And for you eco-conscious consumers out there, this will help lessen your waste production. Large Water Tank: There’s nothing more annoying than constantly being reminded by your coffee machine that you’re out of water. Lower the frequency of this happening by choosing a model with a generous water tank. Dishwasher safe components: Make life easier by choosing a machine that your dishwasher can clean for you. Some machines won’t have parts to clean, but for those that do, look for a model that can easily be tossed in the dishwasher. Customize-able elements: Whether the most important part of your drink is the froth or being able to create an iced drink on those hot summer days, choose a machine that suits your needs. There’re many models on the market, so pick one that hits everything on your checklist. As a pod-based coffee machine, the Muller Ultima offers strong shots of coffee that can quench your espresso needs. While not technically an espresso maker, it provides a close alternative with added convenience, proving you don’t need a professional espresso maker to make high-quality coffee. Compared to other pod-based coffee makers, the Muller Ultima is average in price. This coffee maker has a solid fan base and very positive ratings. Many former Keurig users have since converted to the Muller brand. Users state that this product has many advantages, such as a smoother tasting cup of coffee, a larger cup size option, and a more aesthetically pleasing and compact design. At half the price of a Keurig, buyers are pleased with the quality and durability of this machine. This product’s design resembles a Keurig machine, providing familiarity to users who may be looking to switch to a new brand. The white and light gray color scheme of this machine makes it look brighter and more fun than other coffee machines. It will simultaneously blend in and stand out on your kitchen counter. Variety of Sizes: With 3 different cup sizes, you can easily customize the strength of the cup to match your specific tastes. K-Cup Compatibility: Don’t let your K-cups go to waste, this machine is compatible with any version of the K-cup as well as other pods. Large Water Tank: With a 45 oz water tank, you’ll find yourself spending less time refilling the tank and more time enjoying your coffee. Keurig lovers rejoice, there is finally a way to get your espresso fix using your favorite k-cups. The Keurig K Cafe creates delicious, handcrafted lattes, cappuccinos, and iced drinks with the push of a button. You can even top it off with perfectly frothed milk, giving you the coffee shop experience right at home. In comparison to similar products, this machine is on the higher end of the price scale. However, if you compare this product to other Keurig brand machines, this machine would be mid-range. The Keurig K Cafe is a popular choice amongst longtime Keurig fans and is gaining traction with new users as well. Buyers marvel at the taste of the espresso as well as the ease of making it. Convenience is a huge selling point for this machine since it creates espresso that tastes great without an overly complicated machine or lengthy clean up process. The versatility of making hot and iced drink is also a much loved feature. This machine resembles the classic Keurig machine, except it has a larger water tank and a milk frother system on the right. It features curved edges and simple buttons, giving it a softer, less bulky look. Variety of Cup Sizes: Some days you need more coffee than others, and this machine has your back. Choose from 4 cup sizes ranging from 6 to 12 oz. Large Water Reservoir: With a 60 oz reservoir, you won’t waste time refilling the tank. Easy to Clean: The milk frother is dishwasher safe, making clean up a breeze. Compatible with Reusable Filter: If you prefer to use coffee grounds from your local coffee shop, go right ahead. Custom Drink Temperature: Satisfy your tastes in the summer and winter. With the option to make cold and hot espresso drinks, you’ll never get bored. You get an all in one machine with the Gourmia 6 in 1 Single Serve Multi. If making espresso drinks wasn’t enough, this machine can also brew your favorite teas. Coffee, espresso, and tea–what more could you possibly want? In terms of price, the Gourmia 6 in 1 Single Serve machine is mid-range in comparison to similar products. This product has favorable reviews from its buyers. Even though this machine does not have a large following, its small base of users have given it positive feedback and are satisfied with their purchase. The top selling points of this machine include its versatility and its value. Buyers love that they have the choice between loading K-cups or ground coffee directly into the machine, a unique feature that comparable products do not offer. The price of this machine is also lower than most Keurig brand machines, yet offers the same quality and convenience. Sleek and compact, this machine would fit in nicely with your kitchen appliances. The simplicity of its design is purposeful, reflecting how simple it is to use. Milk Frother: We know your drink isn’t complete without a healthy dollop of foam. This milk frother steams the milk directly into your cup, which means no mess and no extra dishes to do. Compatible with Coffee Grounds, K-Cups, and Loose Leaf Tea: Get a machine that truly does it all, while protecting the flavor integrity of your drink. This coffee comes with separate inserts that ensure whatever beverage you’re drinking will not be compromised by the taste of previous drinks. Removable Drip Tray: This machine will accommodate your mugs and travel cups alike. If you are looking to make a strong shot of single-serve coffee, but you aren’t willing to give up your traditional brewer either, this machine is the answer for you. Simply load the machine with your favorite pod, and minutes later you can find yourself enjoying a strong shot of espresso-like coffee. This product’s price is average, making it accessible to a large group of buyers. With thousands of satisfied customers, this machine has proven to be a popular choice amongst coffee lovers. One of the highlights of this machine is its appeal to both traditional and pod-coffee drinkers. Users love the ability to switch between a single serving or a full pot. Additionally, this machine allows you to program the coffee pot side 24 hours in advance, a feature that other pod-compatible machines lack. Users are also big fans of the single-serving filter that allows you to load coffee grounds directly into the machine. The design of this machine resembles your traditional coffee machine with a twist. Featuring a familiar LED clock surrounded by front-facing buttons, this coffee maker looks approachable and user-friendly. Two Ways to Brew: Whether you need a cup of coffee to go or you’d like to make a whole pot for your household, you don’t need to choose with this machine. You can even brew them at the same time. Brew Strength: With the ability to brew bold or normal coffee, cater your morning beverage to your specific tastes. 24-Hour Programmability: Wake up to a steaming cup of joe, and get your caffeine fix right away. Compatible with Grounds or Pods: We know that you can’t beat the convenience of pods. But if you’re more eco-friendly or prefer the taste of freshly ground coffee, you can load this machine with coffee grounds as well, meaning you never have to compromise. Have you ever found yourself on the road, craving your favorite homemade espresso? You will never find yourself in this situation again with the WACACO Nanopresso Portable Espresso Maker. With the ability to dispense barista grade coffee from Nespresso pods, it doesn’t get more convenient than this. Finally, you can take your espresso anywhere you go. When compared to other portable espresso makers, the WACACO Nanopresso is one of the more expensive brands. However, if you were to compare this product to a traditional pod-based espresso maker, it is average in price. Garnering positive feedback, this product has proven to be a hit with espresso drinkers on the go. The general consensus among buyers is that this machine makes delicious tasting espresso, even when compared to higher-end, “real” espresso machines. The convenience of this machine also cannot be beat, and it’s the perfect gift for frequent travellers. Some minor complaints include the inconvenience of cleaning the machine, since it includes many small parts, and the necessity of buying an attachment in order to use Nespresso pods. However, these issues are small annoyances, and do not detract from the machine’s high ratings. Shirking all expectations of how a traditional espresso maker should look, this machine resembles a portable bluetooth speaker. Pill shaped and small enough to fit in the palm of your hand, this machine looks like an espresso machine from the future. Energy Efficiency: With no need for a battery or electrical charging, this machine runs off manual power. All it takes is 8 pumps to pump out high-quality espresso. 18 Bars of Pressure: Incredibly powerful, this machine contains more bars of pressure than some home espresso makers, with none of the bulk or complexity. Light and Compact Design: Weighing in at 336 grams, you can throw this in your carry-on or camping bag with ease. Detachable Cup: A fully seamless process from start to finish, the Nanopresso even includes a detachable cup for added convenience. You’ll never be stranded without espresso ever again! The Keurig K Elite offers on-demand, espresso inspired coffee. For all you coffee lovers out there that want an extra kick of flavor and caffeine, you’ll love the option for a strong brew. While it’s not officially espresso, it is delicious and convenient. This machine is on the higher end of the price scale. Buyers have given this machine their stamp of approval. Proving to be both convenient and durable, this product has received high ratings from a wide range of users. Users are very pleased with how the Keurig K Elite has made their morning routine a breeze. Making a cup of coffee has never been easier, and users state they can’t imagine going back to a non-automated machine. Buyers lover the taste of the coffee and the variety of beverage choices the Elite offers. This machine has a no nonsense, monochrome design, giving it a bolder look than the original Keurig. The main differentiators between the Elite and the Orignal are the darker color and the wide array of buttons on top. Quiet Brew Technology: Want some peace and quiet in the morning? This machine features technology that minimizes noise while in use. Iced Setting: Enjoy coffee the way you want it–with this machine, you can get a perfect cup of iced coffee every time. Variety of Cup Sizes: You can get exactly the amount of coffee you want with cup sizes ranging from 4 to 12 oz. Auto On/Off: Program your machine to wake up when you do and shut off when you leave. Every die-hearted coffee lover knows the value of being able to enjoy coffee from the comfort of their own home. Coffee makers can range from simple to complex – in terms of their features. And with earlier designs, it is quite the norm for coffee makers to have a built-in reservoir – making them more compact. But having to make several trips between the water tap and the coffee maker can be quite the hassle. Worst of all… it can lead to unwanted spills that you’ll have to spend even more time cleaning up. This is one reason why having a coffee brewer with a detachable water reservoir can make a world of difference. Just a simple glance at the name of this contraption reveals so much about what it actually is, and why it is distinctly different from a regular coffee making machine. A coffee maker, in this context, is a machine which serves the purpose of brewing coffee. A reservoir on the other is a specific area designed to store liquid – in this case: water. Like many other coffee makers, these brewers are equipped with a water reservoir. But even better, with these brewers, you can actually separate the water storage from the machine itself, take it to the tap, fill it with water, replace it and you’re good to go. And this simple function can allow for an overall smoother coffee making process at home. Having difficulty perceiving how these could possibly make any significant difference? Picture a busy mom of three on a Monday morning, trying to get herself and her kids to work, school and the nursery on time. With a toddler in hand, she fills a pitcher with tap water, and hurries over to her coffee machine at the other end of the countertop. As she pours the water into the fitted reservoir, her three-year-old releases a deafening shriek – which absolutely startles her, and she accidentally empties what’s left in the pitcher on to the countertop. There is a wide variety of coffee makers with a removable water reservoir on the market. So depending on their overall need, a buyer can make the selection which best suits them. Their need may be that they want one with the best k-cup, the best budget, the best espresso, the best strength control, the best temperature control and the list goes on. Depending on the combination of features, some brewers are easier to operate than others, so that is another deciding factor. But, generally, these sorts of coffee makers are well-suited for coffee lovers who don’t have the extra time in the mornings to drive to a coffee shop, or to wipe up unforeseen water spills – but who need that perfect cup to start their day, every time. These are also great for those who store their entire coffee machines under a cabinet. This way, they don’t need to remove, and replace the entire machine every, single time they are making coffee. Best of all, they are also perfect for meticulous coffee lovers who simply prefer a clean environment. Since the reservoir can be removed, it can also be easily cleaned, and left of the counter to properly air dry. Coffee makers with removable water reservoirs are no exception. When deciding on which to purchase, it is good to take into consideration, the following pros and cons. • Easier to refill than coffee makers with built-in reservoirs. • Some can store more water than those with built-in reservoirs. Therefore, less frequent refilling is required. • Many have a variety of sizes and can accommodate cups, travel mugs, and even carafes. • Great tasting coffee without the coffee shop price tag. • Some brands have a timer to help you to make a cup at the right time every time, or to determine how fresh your coffee is. • In most cases, making a cup of coffee is as easy as A-B-C.
• Reservoir is easy to clean. • Some brands offer a variety of colors to better match your existing scenery. • Single serve designs are not always economical for company use. • With some brands, they are more expensive than regular coffee brewers with built-in reservoirs. • After a while, the reservoir may leak on some brands. • Some brands have more features and can be a little more complex to use. • Some brands are quite noisy. • Some water reservoirs are smaller than others. So what should you really focus on when deciding on which coffee maker with removable water reservoir to purchase? To conclude, here’s a list of the most important features you should consider if you want to get the most out of your coffee maker. • LCD Display – An LCD display on a coffee maker is a little screen that can come in really handy if you’d love to have a programmable machine. They help make the machine easy to use. In some models, you can even have a color or touchscreen display. • Programmable Timer – This is an embedded clock feature which can allow you to tell your brewer when to start working. This is great if you want to have a fresh cup at the right time, every time. • Water Reservoir Capacity – Water reservoir capacity refers to the maximum amount of water the reservoir can hold at any given time. It’s important to think about this if you’re the kind that simply doesn’t like frequent refills. • Heat Control – This is the machine’s ability to switch between temperatures at your command. This is great if you’re sensitive to heat and want to have greater control of the element. • Strength Control – Similar to heat control, this refers to the coffee maker’s ability to alter the strength of the coffee without having to manually change the cup size. • Automatic Power Off – People forget. This is why this feature is so outstanding. This feature will ensure that your machine has shut down after a predetermined period of inactivity. Very safe and energy efficient. At just a little over ten pounds, the K55 K Classic by Keurig is the best K-Cup single serve coffee makeryou’ll find on the market. It comes come fully decorated in either black or rhubarb – a shade of red – and with a slew of features including auto-off and descaling. For a couple more bucks, you may opt to get one with a storage drawer under the brewer. The storage drawer can hold up to 35 K-Cup pods. The K55 K Class coffee maker is ten inches wide and 13 inches deep, and is coated in a matte finish. It has a silver handle for lifting its lid. And can facilitate three cup sizes and even a seven-inch travel mug! To the left of the brewer, there is a clear, removable reservoir that can hold up to 48 ounces of water. On the top-right, there are three buttons for selecting the desired cup size, one power button and one button to select from the different modes of: adding water, descaling, heating, and enabling auto off. Imagine having an extra few minutes in the mornings, or decreasing the probability of spilling water from a pitcher trying to refill a built-in reservoir. Its removable water reservoir will spare you from making a trip with each new cup of coffee, since it will brew up to six cups before needing a refill. This coffee maker can brew either six, eight or ten ounces of coffee from a K-Cup pod. Unfortunately, it doesn’t allow you to adjust its internal water temperature. But… Never fear! Auto-off is here! This feature will automatically power off your brewer if it’s been left on idle for more than two hours. Say ‘yes’ to saving energy! The powerful descaling feature makes cleaning your coffee maker pretty much hassle-free. It works to remove any long-term build up of calcium deposits or scale in your brewer. It is equipped with a removable drainage tray to quickly dispose of any spills. The K55 K Classic is compatible with a range of K-Cup brands. Included in the package are 4 Keurig K-Cup pods, two water filters, and a water filter handle. The easy-to-use K55 K Classic coffee maker with removable water reservoir is the best K-Cup brewer yet. Its removable reservoir will spare you multiple trips to the water faucet and will, without a doubt, help make your morning routine easier. This brewer is best for household members who don’t have a lot of time to spare in the mornings, but can’t start their day without a good cup of coffee. That’s the first thought that pops into mind at the sight of this budget-friendly coffee maker. In addition to having a removable water reservoir, this coffee maker keeps your coffee hot, and comes with a Grab-A-Cup Auto Pause feature. The Mr. Coffee BVMC-PSTX95 coffee maker with removable water reservoir, is rectangular and is built almost entirely from stainless steel. There is an LCD display in the top right corner – which shows the time and a fresh brew timer. Beneath that, there are three pairs of button: ‘Dim Display’, ‘Hour’, ‘Set Delay’, ‘Minutes’, ‘Delay Brew’ and ‘Clean’. Finally, there is a button which allows you to ‘Brew Now’ or to power the machine off. The removable water reservoir is housed in the left of the brewer. The right side of the brewer houses the water filter, and at the base, there is a stainless steel thermal carafe. This invention is gorgeous on the outside, but does it live up to its promising appearance? Mr. Coffee included both a removable water reservoir and filter basket. This contributes to making the filling and cleaning processes much more convenient. It’s water filtration system is so powerful that it will remove the majority of chlorine (at least 97%). So you’re guaranteed great tasting coffee! No true coffee lover can enjoy a cup of lukewarm coffee. The thermal carafe makes it absolutely unnecessary to use a heating mat, since it will keep your coffee nice and hot. But if you need to get your cup before the brewing is complete, you can just grab your cup and auto pause will stop the brewing cycle. Another automatic addition is the auto shut-off feature – which will turn your coffee maker off after two hours of idle time. The ‘Delay Brew’ option gives you the opportunity of waking up to the smell of fresh coffee, and the fresh brew timer indicates how long your coffee’s been made. The cleaning cycle helps you to get rid of any calcium build-up with ease. We all know never to judge a book by its cover. But if you judged this coffee maker just by its stellar outward appearance, then you certainly deciphered correctly. Its removable water reservoir slides in and out for greater convenience. So, this Mr. Coffee BVMC-PSTX95 coffee maker with the removable reservoir is a great option for coffee lovers on a budget. The Gaggia 14101 Classic Semi-Automatic Espresso Maker comes with a removable water reservoir, and a pannarello wand. Its amazing features make it the best entry-level espresso maker yet! It’s a multipurpose machine manufactured to last from the inside out – whether used in personal or commercial settings. This rectangular espresso maker models a rugged brush stainless steel finish. At the top of the machine, there are three control switches. The first, on the left, is the power switch – which when turned on illuminates a miniature, red-orange light beneath it. In the middle, there is a steam switch which triggers the machine to heat up to steam temperature. At the flick of this switch, the temperature ray light (to its right) will be turned off, and as soon as the machine is at steam temperature, it will again be illuminated. The final switch is the brew switch, and it functions to turn the pump on and off. To the right side of the machine, is the steam knob. Dispensing hot water from the pannarello wand and steaming is manipulated by opening and closing this knob. To the bottom, there is a black drip tray coupled with a white splash guard. Behind the drip tray, you’ll find the removable water reservoir, and a chrome tube standing before it. Right above the drip tray, there is a chrome-plated brass porta filter. The 58-inch porta filter on this machine is the sort you would find in any commercial setting – such as a coffee house. It is equipped with a commercial, pressurized basket. This will allow you to produce that rich, thick crema layer without the knowledge of a coffee-making whiz. It will also allow you to pull a perfect espresso shot every time. The pannarello wand – through its dispense, froth and steam functionalities – will help you to make cappuccinos and lattes like a pro! This coffee maker by Gaggia heats its broiler in as little as 20 seconds for steaming and five minutes for brewing. It is compatible with both pre-ground coffee and Easy Serve Espresso (ESE) pods. This machine is great for making espressos, lattes and cappuccinos, and for frothing milk like a professional barista. It is great for individuals – with some time on their hands – who want that authentic espresso experience from the comfort of their own homes. It is also best for those who don’t mind putting in a little to work to set it up and prime it for use. Though quite miniature, the Nespresso Mini is as majestic to espresso lovers as the grand piano was magnificent to Beethoven. In fact, this single serve coffee maker, with removable water reservoir, comes only in piano black. It is a versatile and efficient performer which presents itself in a neat, little package. This rectangular coffee maker is very sleek, slender and simple in appearance. To the very back of the brewer, there is a removable water reservoir with a lid. At the very top, there are two buttons to allow you to take advantage of the Espresso and Lungo functionalities. Beneath these buttons, there is a lever which is used to eject Nespresso capsules into a used capsule container – which can hold up to six capsules. At the base of the coffee maker, there is a drip base, drip tray and drip grid trio. In addition to all of the above, the Nespresso Essenza Mini comes with a range of other features. Its tiny size doesn’t only make it more portable, but will save you a lot of countertop space. So, if you have space that’s three inches wide, this little machine will fit snugly into place. Its one-touch operation and extraction system makes its super easy to create the perfect cup with each use. Feel free to say ‘thanks’ to its 19 bar high-pressure pump, and quick heat up structure which work together for flawless coffee creation every time. This resourceful gadget also knows a lot about saving time. It heats up to the ideal serving temperature in just 25 seconds, and it automatically switches off after only nine minutes. Its flexible nature allows you to effortlessly switch between 1.35oz and 5oz cup sizes. Every purchase includes a welcome kit with 14 coffee capsules of varying aroma profiles. Nespresso’s Essenza Mini with removable water reservoir is the best Nespresso addition to the coffee lover’s kitchen. It comes in a small package for convenient storage, and is straightforward enough for easy use – even by the first time user. If you’re the kind of coffee lover who likes to save time and space, this is definitely a great buy! What does a coffee lover do if the temperature just isn’t hot enough? They adjust; using a microwave. But why pop your cup of coffee into the microwave when you can have the Keurig K575 Single Serve? It comes with temperature control and a removable water reservoir. Weighing almost a whopping 14 pounds, this Keurig single serve coffee maker is available in platinum, and can be accompanied by a silver carafe if preferred by the buyer. At the left-hand side, there is a transparent, removable water reservoir with a flip-top lid. On the front-left panel, there is a cool nightlight that can change between red, white, blue or green. To the middle, there is a touchscreen which displays a home screen and a screen for coffee pod manipulation. The power button sits comfortably beneath the home screen, and on top of the brew head. Beneath the brew head is the drip tray and its reliable companion – the drip tray plate. With the Keurig K575 Single Serve you can save tons of time with the removable water reservoir! The reservoir allows you to make over ten cups before ever having to refill it. Plus, there is a nightlight sitting right in front of the reservoir. This coffee brewer facilitates five different cup sizes namely: four ounces, six ounces, eight ounces, ten ounces and 12 ounces. This means you can use a cup, mug, and even a carafe! What’s even more amazing is that it gives you the ability to control the temperature of your beverage. And – with its strength control setting – you can alter the boldness of your coffee no matter the size of your K-Cup pod. The touchscreen is extra large and comes in full color. With it, you can program your brewer to automatically start working or turn off at a specific time. Keurig’s K575 Single Serve brewer with removable water reservoir is the best deal you can get for a temperature controlled coffee maker. Its water reservoir adds to the convenience it brings, and its temperature control allows you to drink your coffee at a degree of heat that is just right for you. For the early commuter who needs to make their coffee before sunrise, this is absolutely a great selection! When it comes to coffee, what is strong for one person may be weak for another. This is why it’s super important to have a coffee maker with the great strength control. The Keurig K250 Single Serve has a removable water reservoir, a touch screen and outstanding strength control capabilities. The Keurig K250 Single Serve shows off a modern look, and comes in black. But if you’d like to add a pop of color to your morning, it’s also available in imperial red, oasis, peacock blue, plum grey, sandy pearl and turquoise. To the back of the unit, there is a translucent, removable water reservoir with a detachable lid. On the top housing, there is a black and white touch display screen and power button. Beneath that section, is a simple, round brew button. Under the top housing, is the brew head, a drip tray and a drip tray plate. It’s great that this coffee maker is stunning on the outside, but none of that matters if it doesn’t work wonders. The removable reservoir can hold up to 40 ounces of water – which can make at least four cups of coffee before a refill becomes necessary. With the two-inch touchscreen, you can have your coffee is less than one minute. It facilitates K-Cup pod sizes: four, six, eight and ten ounces, and will brew a Carafe up to 30 ounces. It also accommodates K-Mug and K-Carafe pods as well as My K-Cup reusable filters. Take advantage of the opportunity to brew a bolder cup with its strength control setting. It is packaged with 4 complimentary K-Cup pods, two water filters, a water filter handle, and a bottle filled with descaling solution to help you bless your coffee maker with a life of longevity. Keurig K250 Single Serve coffee maker with removable reservoir does a great job of helping coffee lovers save time. Because of its strength control feature, it would be a great addition to a household of coffee drinkers who have varying gustatory needs. IIt’s the age old dilemma–you enjoy a steaming cup of coffee in the morning, while your partner would rather have a cup of tea. In the chaos of your morning routines, you find yourself bumping into each other while you are using the coffee maker and your partner is doing the dance of heating water either on the stovetop, in the microwave, or in an electric kettle. Seeing the hoops your partner has to jump through to get their morning fix, in comparison to the pot of coffee that is waiting you every morning at 8 am, makes you think there must be a simpler way. Thankfully, the days where your coffeemaker only offered one button, the on/off switch, is gone. Instead, you now have the option to purchase a coffee maker that can also dispense hot water, catering to all of your household’s needs while adding simplicity to your daily routines. Before we take a deep dive into the world of coffee makers with hot water dispensers and the added benefits, let’s start simple. What exactly is a coffee maker with a hot water dispenser? The definition varies depending on the model of the machine. Most often, you will find that the coffee maker and the hot water dispenser are separate, each pulling from their own water reservoirs and dispensing the liquid through different spouts. This means you can make coffee and hot water independently from each other, but through the same machine. The coffee machine side usually offers few surprises, functioning the way you’d expect a coffee maker would function. On the other hand, making hot water usually involves pouring water into the reservoir, pressing a button to heat the water, and then holding down the dispense button to release the hot water. The process isn’t hard to figure out and involves one less small appliance in achieving the perfect cup of hot water. Even if you aren’t a tea or cocoa drinker, you could use the hot water dispenser to make oatmeals, instant noodles and soup alongside your cup of joe. The convenience of having two functionalities in one machine means the possibilities are open-ended. There are quite a few sectors of society that would benefit from purchasing a coffee machine with a hot water dispenser. As mentioned earlier in the piece, a couple with differing beverage choices might find that this machine makes coordinating their mornings easier and creates less stress in maneuvering around the kitchen. Additionally, the rare-breed of people who are avid coffee and tea drinkers would find this machine convenient and space saving. Nowadays, since most people own more small appliances than they can use (or properly store), a two-in-one machine provides compactness and practicality. For city-living folks with a cramped kitchen or shared communal space, this appliance may be the solution you didn’t even know existed. Lastly, this product even suits families with small children. Even though you need that jolt of caffeine in the morning, you know your kids do not. Instead, you can use the machine to whip up breakfast or dinner without any cleanup. Oatmeal? You can make that in flash. No more waiting around for the water to boil. If you are tired of hearing your kids complain about how long “instant” foods take to cook, you might want to invest in one of these versatile machines. Space Saving–This is one of the top draws for users looking to upgrade their coffee machine. Why take up precious counter space if you don’t have to? A coffee maker with a hot water dispenser takes up less room than a traditional coffee maker and electric kettle, saving space without sacrificing functionality. Convenient–It goes without saying but boiling water can be a pain, especially if you don’t own a kettle. This leaves you with two options, you can either heat water in the microwave or in a pot on the stove. The problem with the microwave is that it gives you hot, not boiling, water at best, which results in less flavorful tea or uncooked noodles. But the benefit of the microwave is that it involves no dish washing, which you’d have to do if you boiled water on the stove. Thankfully, with a coffee maker with hot water dispenser, you don’t have to be stuck between two less-than-ideal options. Time Saving–Most machines are more efficient than your typical electric kettle. In fact, the water heats up faster than an electric kettle or microwave (and it goes without saying, it’s lightening years faster than the stovetop). No Waste-–It’s hard to gauge how much water to pour into your kettle or pot, but now it’s easy to dispense the exact amount of water you need, creating no waste. Issues with Durability–Many of the mid-range models have a problem with durability. Users note that the hot water dispenser stops functioning after a few months, which means you now own an appliance that only half-works. Unless you are willing to shell out a considerable amount of money for a top-tier product or take a risk on a mid-range model, you may be better off, in terms of quality and price, buying two separate products. Small Water Reservoir–Depending on what kind of model you get, you may be stuck with a small water reservoir, meaning you need to refill the machine after each use. Some people may find it more convenient to just boil a large batch of water at once. Sacrificing Taste–Even though coffee taste varies from person to person, there is a consensus that the coffee from these dual machines is, in a word, unremarkable. If you are looking for a coffee machine that gets the job done, you may be perfectly happy with your purchase. If you are a coffee fanatic with hard-to-please tastes, you might want to invest elsewhere. And as for the hot water, there have been some reports of the hot water tasting of coffee due to leaks in the reservoirs. A Large Water Reservoir–If having to refill the water tank multiple times is enough for you to break out the kettle again, look for a coffee machine with a large water reservoir, like the Cuisinart CHW-12 Coffee Plus. Programmable Coffee and Water Dispenser–If you want your morning tea to be ready in the morning like your coffee is, get a machine that has two programmable sides, so no matter what you choose to drink that morning, you won’t have to wait. Check out the Hamilton Beach 49982. Brew Strength–Personalize your coffee by selecting the strength that fits your taste, like the Mr. Coffee BVMC-DMX85-RB. Brew Pause–Start your day off right with a feature that allows you to have a cup of coffee while you’re waiting for the rest of the pot to finish brewing. Depending on your budget and your household needs, investing in a coffee maker with a hot water dispenser may or may not be for you. One thing is for sure–making hot water shouldn’t be a pain. If it is, you should explore the possibilities of an all-in-one machine. The Cuisinart CHW-12 Coffee Plus machine features a hot-water dispenser that functions independently from the coffee maker. This feature ensures you get fresh, hot water every single time, and you can even use it while brewing your morning cup of coffee. Compared to other coffee makers that feature a hot water system, the Cuisinart CHW-12 Coffee Plus machine is of average price. This unit is a popular choice for many buyers, especially those who are looking for a convenient way to make coffee and tea (or cocoa, soups, and oatmeal). Its users have generally positive feedback for the machine, minus a few complaints here and there. Buyers love that this coffee machine adds convenience to their morning routine and cuts down on the number of small appliances they own. But some users note that with the added convenience, there may be issues with the hot water dispenser leaking or breaking after a few months of use. Overall, most users agree that the coffee maker itself is reliable and has an array of useful features. If your main reason for purchasing this unit is for the hot water system, you may want to look at more durable options. This dual coffee maker and hot water dispenser has a sleek rectangular design, giving it a more modern look. Its simplistic, no-nonsense design is both functional and most importantly, space saving. The unit also features a clock and minimalistic buttons that are very user-friendly. Carafe temperature control: Keep your coffee at the temperature of your choice, with high, medium and low temperature settings. Brew-pause: Instead of waiting for the entire pot to brew, you can simply pause, pour, and enjoy a cup of coffee with no down time. Self-clean: Get some time back in your busy day with the self-clean feature. Removable drip tray: With this feature, you don’t have to worry about your travel mugs not fitting under the dispenser. Just fill up and go. For coffee and tea drinkers looking to simplify their morning routine, this product’s compactness and convenience just can’t be beat. The Mr. Coffee Versatile Brew machine is a coffee maker and hot water dispenser in one. The hot water feature allows users to make tea, oatmeal, and soups with a push of a button. It’s a feature that appeals to both coffee and non-coffee drinkers. The price point for this machine is mid-range. It is comparable to other coffee machines with hot water systems. But judging by the reviews, the average price point should not be enough to entice you to buy this machine. Buyers of this machine have generally negative feedback concerning the quality and ease of use. Many users are unhappy with the 2-hour heating feature, which doesn’t allow coffee to stay warm for over two hours. Another added inconvenience is the fact that the hot water dispenser only holds a small amount of water, meaning it needs to be refilled after every use. A positive aspect is that the hot water does heat up quickly. Lastly, and most problematic, is the coffee maker’s short lifespan. Many buyers note that their units stopped functioning after a few months of use. The coffee maker’s design is traditional, featuring a gray and black color scheme and curved edges to give it a softer look. It is sure to fit in with a buyer’s existing kitchen appliances. Brew Strength Selector: Brew a cup of coffee that truly fits your unique taste. With this feature, you can choose a stronger brew for a bolder taste. Grab-A-Cup Auto Pause: Don’t wait for the pot to finish brewing, enjoy a cup of coffee now. On/Off Light Indicator: Know exactly when your hot water is ready to dispense–no more guessing games. Even with the array of features included in this machine, this machine fails to satisfy the needs of coffee or non coffee drinkers. If you are looking for a quality coffee maker and hot water dispenser, this should not be your go-to product. The Hamilton Beach 49982 offers versatility for both coffee and tea drinkers. With a programmable hot water dispenser, you can have hot water waiting for you when you wake up, alongside your cup of coffee. With a 32-ounce water capacity, this machine can satisfy your tea, cocoas, and oatmeal needs all at once. In comparison to similar products, the price point of the Hamilton Beach 49982 is mid-range. By opting for a mid-range product, you may be sacrificing the higher quality that a more expensive product offers. A less popular coffee maker in comparison to its counterparts, this product has garnered mixed reviews from its customers. The scattered reviews of this machine indicate that there are still improvements to make on this model. The biggest complaint for this machine is the inconvenience the coffee reservoir lid poses. The opening is very small, meaning it’s hard to fill the machine without making a mess. Users also describe the temperature of the hot water as lukewarm instead of boiling, which can be a turnoff for tea drinkers. A handful of customers also state that the coffeemaker feels cheaply made and the hot water dispenser became faulty with continued use. It appears you may be sacrificing quality for the added convenience of having two appliances in one. The unit’s design does not deviate from what you would normally expect of a coffee maker. Featuring grey steel on top and a glass carafe with black accents, the only differentiating aspect of this coffee machine is the hot water dispenser found on the right-hand side. The machine appears a bit bulky on top but is still compact in comparison to similar coffee maker/hot water dispenser units. Programmable coffee maker: That’s right, you can program the coffee separately from the hot water dispenser, meaning you’ll never have to wait on a morning cup again. Cone Filter: Unlike some coffee makers, this unit features an ergonomic cone filter that ensures all grounds are evenly covered with hot water. Brew Strength: Choose your ideal strength of coffee without compromising taste. Automatic shutoff: Ever forget to shut off your machine before you leave in the morning? No worries, this unit will take care of that for you. If you are looking for a coffee maker and hot water dispenser in one, and are willing to sacrifice durability for the added convenience, this may be the product for you. The Ninja Hot and Cold Brewed System is an all-in-one solution to your coffee and tea needs. With its ability to recognize whether you are brewing coffee or tea, it offers a hot water system embedded into the coffee maker. Switching seamlessly from coffee to tea automatically, you’ll never have to pull out your electric kettle again–which means less complications and more time to enjoy your hot (or cold) beverage of choice. This coffee system is considerably higher in price than similar products offering a hot water system. However, its high-end price is reflective of its higher quality and the many unique features that most other coffee makers do not include. This coffee system has received glowing reviews from the majority of its users, proving to be a popular and stand-out choice in comparison to competitors. The most loved features of this coffee system are the different brewing temperature settings and the wide range of cup sizes available. Users say that these features, very rarely offered by other coffee machines, makes each drink feel perfectly customized to their tastes. Beyond its high-tech features, buyers also rave about the taste of the coffee and tea produced. They state there is a noticeable difference between the taste of coffee brewed using the Ninja Hot and Cold Brewed System versus a cheaper product. Even with its high price tag, users report that the machine is worth every penny. The design of this coffee system is reflective of its high-tech nature, looking and feeling more modern than the one-pot coffee makers of the past. Featuring curved edges and a compact feel, the black and stainless steel machine looks user friendly and unintimidating, even with the abundance of settings and features available. In addition, the included milk frother is entirely collapsible into the side, keeping the machine sleek and not clunky. 2 Ways to Brew Over Ice: You can enjoy cold drinks on demand that never taste watered down. With 2 temperature settings for cold drinks, you can create a truly personalized drink. 6 Brew Sizes: Have full control over how much coffee you want to make. You can even make a single cup of coffee without having to purchase expensive and wasteful coffee pods–talk about being environmentally friendly! Hot and Cold Frother: Take your coffee or tea to the next level with the collapsible beverage frother. You might even find yourself skipping visits to your local coffee shop to enjoy an at-home beverage instead. Separate Coffee and Tea Baskets: This will ensure your drinks are always fresh and full of the flavor you want. This also allows the machine to auto-detect which type of drink you are brewing, without you having to change the settings. If you’re a coffee or tea drinker looking for a machine that can do it all, this product should be at the top of your list. The Sunbeam Hot Shot Hot Water Dispenser dispenses hot water at the push of a button. It is a specialized small appliance that has one use and one use only. In comparison to other hot water systems and electric kettles, this machine’s price point is very low, which is likely an enticing feature to buyers. Unfortunately, its affordable price is reflective of its quality, with many buyers noting that their machine lasts only a few months and is not worth the money. This version of the Sunbeam Hot Shot Hot Water Dispenser is not popular with long-time or first-time users. It has proven to be less durable than its previous model and more likely to break in comparison to an electric kettle or coffee maker. Many buyers are regretful of their choice to buy this product due to its short lifespan. Especially problematic, as noted by a large portion of users, is the tendency of the hot water dispenser button to break off, rendering the appliance useless. This machine only has one use, and it does not even deliver on that one use. The machine’s appearance is simple but effective, mimicking the look of a classic coffee maker. It’s traditional design means it is easy for any user to intuitively know how to work the machine. Smaller than your traditional coffee machine, it will also compactly fit on any countertop or desktop. Quick Heat-Up: Free up your microwave and skip the dish-washing by efficiently heating water in the Sunbeam Hot Shot. Auto Shut-off: Never stress about whether you left the machine running again. With its ability to auto-detect when the cycle is over, the Hot Shot will do the shutting off for you. Cord Storage: No more clunky cords to wrap up when you move the machine. This cord fits into its base. For tea, cocoa, oatmeal and instant noodle enthusiasts looking to retire their electric or stove top kettles, look elsewhere for a more reliable option. Are you falling out of love with your French press? Is it a while since you have drunk a really smooth and mellow cup of coffee? Although the filters in French presses have come a long way since the early days when cheesecloth was used, many single filters still don’t trap all the grounds. Perhaps you should ditch your French press and try another brewing method? Or perhaps you should stick with what you know and buy a French press with a double filter? One of the nicest parts about making coffee with a French press is the fact that it gives you so much control of the brewing coffee. You get to decide the size of grounds to use, the temperature of the water to use and how long you will wait for the coffee to brew. It is a method for a real connoisseur with an eye for detail. And it is a real shame, when such a sensory process is ruined by rogue coffee grounds. So what are the most important features to look out for in your french press with a double filter? To state the obvious, one of the most important features that your next French press must have, is a dual filter- or at least more than one filter. You are sick and tired of tasting grounds in your coffee or you don’t want to drink the coffee sludge at the bottom of your cup. Make sure that the French presses that you are looking at have multi filters. The best filters in french presses use a certain grade of stainless steel that is designed to be used with food or drink. 304 grade or 18/10 grade stainless steel is made to stay rust free forever. After that, your only decision is whether to buy a glass French press or an insulated French press. Just make sure that any plastic part of your press is BPA free. BPA is a toxic chemical compound which was used widely in the plastic industry from the 1960s. Unfortunately, it was found to be potentially very harmful to humans because it can interfere with our hormones and bans were introduced in the early 2000s and most manufacturers now don’t use it. But to be safe, just double check. Finally in this section on materials, if you do opt for a glass French press, make sure that it is made from borosilicate glass. This is a special type of glass which has boron oxide added to it to make it much more resistant to heat than standard glass. Borosilicate glass is built to withstand boiling or near boiling water whilst ordinary glass isn’t. How much coffee do you like to drink or how many people do you regularly make coffee for? Most of the French Presses in my comparison make 8 cups or have a 34 oz.capacity which is the perfect for a multi cup coffee addict or someone who makes a pot of coffee for a group of colleagues. It is easy to become a little obsessive when we are looking for things to buy. We start out with a list of key qualities that product X must have and then we find a product that we like and all of a sudden we are going off on a tangent and looking at products that don’t quite meet our needs. Stay focused during your research. If you are a bit clumsy and you have a tendency to knock your French press then you might want to stay away from a glass one. Or if you like to make a pot that you will drink over a few hours, then narrow your search down and only look at French presses that are insulated. Any item that you will use regularly needs a very good warranty, preferably for life. After all the time and money that you have spent on your new French press, it will be a shame to waste it if for some reason your French press breaks through no fault of your own. And now, let’s take a look at my favorite french presses, all of which have at least two filters. When it comes to getting that perfectly smooth cup of coffee, you are going to want a French Press maker which delivers a filter system beyond your wildest dreams, which is exactly what this little beauty has to offer you. The 4 level filtration system works to deliver you the purest brew imaginable, with absolutely no grounds left, ruling out any sorry sludge, and delivering a cup of coffee you can be proud of. As well as delivering a great cup of Joe it is also very easy to clean, easy to use and easy to understand why so many people love it. If there was one downside, it would be the few complaints at the handle being of poor design, with some finding it to break after just a couple of weeks. It is not the cheapest on the market, so these breakages can be very frustrating, but with that said, it is arguably the best tasting coffee out there. Another French Coffee Press with a great filtration system is the Ritual French Coffee Press. It might not be of the same 4 level filtration system as the previous make but it does have a dual layer precision filter which delivers a smooth and delicious cup of coffee for you to enjoy, with little to no grounds left behind. While the previously mentioned French Press does seem to have some design and durability issues, that is definitely not the case with what we have for you here. Not only does the Ritual French Coffee Press have a top notch design, it is also up there with the best in terms of durability. However, there are the occasional complaints of broken handles, and warped lids, which are easily fixed anyway, since this does come with a lifetime guarantee, not that you are ever likely to need it. When it comes to the taste and smoothness of the coffee itself, this doesn’t quite seem to suit everyone’s taste buds, with a few people annoyed with the amount of grounds which it seems to leave behind, making for a bitty cuppa. However, there are plenty of others who have insisted that this is not actually a problem if you are using it right. At about half the price of the usually French Coffee Press machines out there, this is definitely going to be money well spent. Now we have something which really does seem quite special. When it comes to the future of the French Press coffee maker, this has really revolutionised the way things are done, by introducing the first ever French Press to offer a unique two screen system. With the first screen making sure to brush the wall as tight and as even as possible, the second screen takes over to assure that it does not let even the tiniest of coffee grounds get through. As if that was not impressive enough, you can even use this for a number of other functions, allowing you to not only have a delicious cup of coffee, but also getting to decide between tea, hot chocolate, frothy milk, cashew milk, almond milk, cold brew, lemonade, herbal drinks, fruit infusions, and plant tinctures, all thanks to the ability to keep all of the aromas and flavours inside. There is no denying that this is quite possibly the best at what it does. If there were to be any negatives, it would probably be that it could be a little bit bigger, while the price is a little on the high side, although it is worth every cent. Another French Press which boasts a four level filter system, is the BASA French Press Coffee Maker, which is up there with the others of its kind in terms of quality. A lot of people have suggested that too many coffee grounds get through for their liking but, taking that into consideration, it still does manage to deliver a great cup of coffee. It is simple to use, even for a newbie with no experience of the French Press, and is also very easy to clean. While there have been some complaints that this machine is not durable enough and is prone to break fairly easily, it seems that this is a tiny complaint among a small group of people. However, if you handle this correctly and use it as you are supposed to, then you will not find any issue with it at all. With that said, it is not exactly on the cheap side of French Press coffee makers and you can easily get something cheaper but then you might have to sacrifice the quality for the price. As with everything, there are some good things and some bad things to be aware of with the Tartek French Press Coffee Maker. The end product is a beautiful tasting cup of Joe, thanks to the double fine mesh filters, which give it the ability to keep back almost all of the coffee grounds which go in, while still managing to let through those essential oils to deliver that beautiful taste. As well as that, you can also mix things up by going for some cold drinks, instead of hot, with a wide range of different beverages to choose from. The downsides to this French Press? Well it looks like the design is not exactly the best on the market, with the occasional complaint that it is too heavy and could improve with toning down some of the design features to make it lighter. However, while it is on the upper end of the price scale, when it comes to the taste of the coffee, it is definitely worth the money, just be aware that it is prone to breaking under heavy handling. Travel press coffee mugs are great. They combine the portability and convenience of travel mugs with the perfectly extracted, great tasting coffee a French press provides. No longer do you have to sacrifice quality for convenience. But, before you go out and buy just any old French press-style travel mug, consider these important features. A seemingly obvious feature, it’s important not to overlook this, when buying a travel press coffee mug. Remember, that when brewing your coffee in the same container in which you are travelling with, you have to factor in your coffee grounds. Coffee grounds take up space in addition to your water and brew pressing device. The proper coffee ground to water ratio for French presses is approximately 2 tablespoons (0.5oz) per 6 oz. of water. If you want to store and drink 12-oz of coffee for example, maybe go for a 14 – 16-oz mug. Also known as a plunger, there are many different types of presses with many different filters as well. Most use a stainless-steel or micron meshed filter to make sure no coffee grounds get into the body of your coffee. This is extremely important, considering you will be drinking straight from the mug. Any travel press coffee mug that boasts a double-filtered system, locking mechanism or separate compartment for brewing is great and sure prioritize a fine filtration process. Over extraction is something controllable by a good filter as well. A lot of higher end travel press coffee mugs will have a system or special filter to stop the extraction process of your coffee once brewed. **Pro tip: Any filter that is made for “coffee or loose-tea” will provide better filtration as loose-tea is odd in shape and requires fine filtration. Being ‘double walled’ or ‘vacuum sealed’ are great features to have in your travel press coffee mug to maintain your coffees temperature. Whether it be hot or cold, you want your coffee at the correct temperature to maintain its great taste and consistency. Double walled refers to the construction of the mugs outer body or walls. The thickness of the container’s walls, determine how much heat can enter or exit through them. If something is described as ‘double walled stainless-steel’, it means it has two layers of stainless-steel. Double-walled insulates better than single-walled, but not as great of an insulator as triple-walled. Vacuum sealed, means it reduces heat transfer through the air inside the mug or containers walls. If a travel press coffee mug is vacuum sealed it means it will maintain the liquids temperature well. The most common terms you will hear when describing a travel mugs insulation is ‘double-walled’ or ‘vacuum sealed’. The combination of the two, ‘double wall vacuum sealed’ is best. For travel, you don’t want anything breakable or made with harmful chemicals that you could possibly ingest. Glass is breakable and plastic is often made with harmful chemicals that can leach into liquids (especially when heated). Stainless-steel has proven to be the best material for travel mugs. It is both durable and can be made without the use of chemicals such as BPA’s; which are often found in plastics. Parts of your travel press coffee mug are ok to be made from plastic, but ideally you don’t want any plastic coming into contact with anything you will ingest. This means water, loose tea or coffee grounds. If possible, it is always best to go with anything that states ‘BPA FREE’. Silicon is a great alternative to plastic and can be used in a variety of different ways. **BPA stands for bisphenol A. It is an industrial chemical, used since the 1960’s and has been proven to be harmful to humans when ingested. One reason why you may have chosen to research buying a travel press coffee mug is for convenience. Being able to brew, store and drink all from the same container is very handy and requires less cleanup than its alternatives. To make things even easier, try to find a travel press coffee mug that is dishwasher safe and with an easy to rinse filter. There’s nothing worse than leakage or spillage… especially when it comes to coffee. An extremely important aspect of any mug designed for travel is that it is both leak and spill proof. Ideally, you want something you can store in your bag, lay on its side and move around a lot without having to worry about it leaking or spilling. Some mugs, will have a locking mechanism for travel, others a sealant ring around the lid. If a manufacturer has put extra effort into making their product ‘Leak-Free’ or ‘Spill-Proof’ they will often advertise it. Most travel press coffee mugs do prioritize this, but it never hurts to take a look at the consumer reports or reviews to see if anyone has had issues with a leaky or spill prone travel container. The lid type is actually quite important and does not only effect how you drink your coffee. It’s the one piece of a travel press coffee mug that ties everything together. Insulation, drinkability, press type and spillage are all effected, controlled and can benefit from a good lid. If you want a travel mug that can be stored in a pack or bag, you probably don’t want a plunger handle sticking out of the top of it. If great coffee kept hot is what you’re after, maybe a dual-system or insulated lid will be handy. Some have locks to prevent spillage and others, handy carrying loops. Whatever your specific needs require, make sure you’re thinking about the lid type. Generally, this aspect of a conventional travel mug is an afterthought. When it comes to travel press coffee mugs this is actually very important. A travel press (for travel) can entail brewing sometimes in peculiar or less than steady circumstances. Even if your travel press coffee mug is merely for your morning commute, it’s always nice to have a good handle on things. Silicon is a popular (and frankly the best), option for outer hand grips. It’s a great insulator, heat protectant and is soft to the touch… plus silicone is 100% BPA free! It ticks all the boxes and is a great addition to any travel mug, especially when used in place of plastic. If you are interested in, or have decided to make the switch to a travel press coffee mug, you are most likely someone that is busy or takes coffee on-the-go. But that doesn’t mean you still don’t appreciate the taste and consistency of great coffee. Travel presses (especially French press style) coffee mugs are a convenient way to enjoy coffee, brewed the way it should be. This is by hand and with the close attention of an experienced, smart coffee connoisseur. Or in less pretentious terms, someone that loves properly brewed coffee! Whether you’re a student, working professional, busy stay-at-home parent, commuter or travelling nomad, a travel press coffee mug is the perfect choice for you! 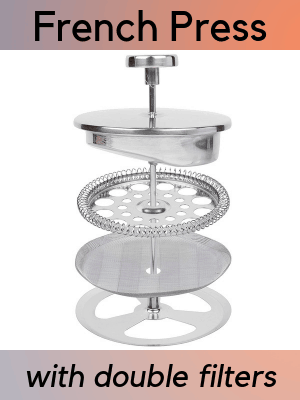 In terms of price, the Bodum Travel Press is pretty average. But, in terms of convenience, it is much more than that. Consumers love this all in one; brewing, drinking and heat-maintaining, mug, as it has become very popular… and for good reason too! Its sleek design with metal accents and color options, give it a very modern and hip look. In fact, it looks just like a stylish travel mug. So much so, that the fact that you can actually brew coffee on-the-go with it as well as transport it, is almost unnoticeable. Double vacuum sealed walls, keep the heat and freshness of your coffee preserved for hours. This particular travel press from Bodum can hold up to 15-oz of coffee at a time, comes with a spill resistant lid, built-in French press style plunger and silicon hand grips. It is dishwasher safe and customers love it for its convenience as well as sleek design. It can brew, transport, and keep your coffee hot for hours. The all-in-one, Bodum Travel Press, is perfect for anyone who appreciates style along with portable and great tasting coffee. This is a higher-end, travel coffee press made by Espro. Being that it is a higher-end device, you would naturally expect it to have some number of heightened features, improved design or capabilities…. and it does. You will not be disappointed when using this travel press for coffee or tea. With an intelligent, basket shaped, two-filter system, you’ll be assured to never experience any grit or residual coffee grounds when drinking your coffee. This sleek and simple looking travel press has color options and looks just like your standard travel mug. This is in part because it can also be used as just a standard travel mug. As well as being able to brew up to 10-oz of coffee directly in it, you can also use it as a travel mug, holding up to 15-oz of already brewed coffee. It is made with a double wall vacuum sealed stainless-steel body. The two-filter (or microfilter) system allows for French press brewing as well as the ability to brew pour-over coffee. It is compatible with paper filters if you prefer less oily coffee with zero chance of grittiness. Its filtration system also stops coffee extraction automatically once the press plunger is pushed down. If you are primarily a tea drinker, and love loose-leaf tea, you can opt for the ‘Tea Filter’, in which coffee extraction can be stopped with the touch of a button. With this option the tea is also filtered twice. All of this, with the added ability to keep your coffee or tea hot for 4-6 hours is why customers absolutely love this two-filter, travel French press and pour over travel mug. If you’re someone that hates grit and loves intelligently designed and versatile coffee brewing on-the-go, then you’ll love this travel coffee press from Espro. A mid-ranged classic travel press mug for the average coffee drinker. ‘Classic’ is the best way to describe the Stanley Classic Vacuum Travel Press Mug because of its design and physical appearance. Resembling a retro travel thermos, this 160z teal colored press mug looks as if it belongs in a black and white movie, or best enjoyed in the back of an air-stream trailer. It’s made from stainless-steel, is vacuum sealed and BPA-free. Being able keep coffee (or general liquids) hot for 4-hours, cold for 5-hours, and frozen for 20-hours, makes it great for long hiking trips or adventures. To help facilitate these activities, it also has a foldable carrying loop, making it easy to secure or clip onto backpacks. Its plunger device for brewing is unique, unattached to the lid and completely removeable (unlike many travel press coffee mugs). This is a retro mug. Think hipster. Customers absolutely adore this travel press mug, but mainly for their emotional attachment to it. For how cool it looks and how different it is than other mugs on the market. In terms of functionality, there are definitely other travel press coffee mugs on the market that can deliver better heat maintenance with more intuitive designs. But for how unique it is, the cool look and overall feel it gives off, the Stanley Classic Vacuum Travel Press Mug is definitely a one-of-a-kind travel press coffee mug, for certain one-of-a-kind individuals. As far as French press travel mugs go, this is about as economical as it gets. The single-serve, Zyliss Travel French Press is a great and very budget-friendly option. Judging by its appearance, you would never guess that this coffee mug has the ability to brew coffee as well. It merely looks like a well-insulated, home-style, black coffee mug. And although it is well insulated (being double walled to keep heat in), it is far from a standard home-style mug. To use, merely add your coffee grinds as you would any other French press travel mug, and then your water. Instead of a plunger style press, this particular mug uses a handheld, mesh filter that clips onto the side of the mug once pressed down all the way. Once this is done, you can snap on the travel mug styled lid and voila!… you have a single serving of French press brewed coffee in a home-style, insulated mug. Zyliss is known for their craftsmanship and using high-quality materials. This particular mug is made without the use of harmful chemicals such as BPA’s. Feedback on this mug is overwhelmingly positive for its convenience and innovative design. One drawback is sometimes gritty coffee. This is as a result of the small brewing capacity. Although very convenient, there is no ability to stop the brewing process. If left for long periods of time, over extraction can occur and can cause gritty or thick coffee. This is not uncommon among a lot travel press mugs, but more noticeable in a small container. The solution to this is simple… drink your coffee faster! For those who work in an office, at home or like to enjoy coffee conveniently in a home-style mug with little cleanup, the Zyliss Travel French Press Mug is a great option! This is an amazingly priced, portable and all-around great, mid-ranged French press coffee brewer and travel mug. Its smart, innovative and simple design has made it a staple for travellers, outdoor enthusiasts and anyone wanting to brew and enjoy perfect coffee on-the-go. The Kohipress is all black, double-wall insulated and vacuum sealed and resembles an aero-press. Its long, slender design makes it easy to pack away in your bag and allows you to brew 12-oz of perfect coffee wherever you are. Using a full immersion steep, the Kohipress takes the word ‘plunger’ to a whole new level. Its giant, pressurized plunger press has a patented self-locking system that separates used coffee grounds from your coffee once brewed to avoid over extraction. A fine micron stainless-steel mesh keeps all grounds out of your coffee, and the entire device is very easy to clean. The plunger is made from plastic, so if you are averse to plastic or possible BPA’s, another stainless-steel option might be a better choice for you. Thinking of every aspect of portable coffee brewing / drinking, the Kohipress is leak-proof. This is just one of the reasons why consumers love it. It’s truly one-of-a-kind and great for travel. Like any one-of-a-kind product, there will always be imitators. But, for the reasonable price of the Kohipress, I would recommend going for the real thing as opposed to trying to save the marginal amount you would, by buying a knock-off for cheaper. For a traveller or anyone wanting a great, portable, French press coffee brewer travel mug with no chance of grit or over extraction, the Kohipress is an obvious choice!